The Grand Canyon is a stunning example of the beauty erosion creates. River deltas show off erosion’s good side, too: rich soil carried downstream to form fertile land. But when this natural force threatens to rearrange your property, it’s important to identify its powerful energy before it’s too late. Erosion happens when water – rain, snowmelt, leaking pipes, water underground or surface water features such as creeks – lifts soil and carries it to a different location. This process – limited and gradual or sudden and catastrophic – creates significant property challenges. By removing soil nutrients, erosion starves plants of the substances they need to thrive, endangering lawns and landscaping. It also shifts terrain, which can trigger flooding, trip hazards and even dangerous subsidence that quietly threatens foundations and structures from beneath. Sink holes, which have famously swallowed cars and even people when the earth yawned open without warning, are extreme examples of subsidence. Hard rainfall: The impact of the water striking surfaces, particularly bare soil, can loosen dirt and make it easier to transport. Slope length and steepness: Long, steep slopes allow water to course more quickly, picking up speed and force over longer distances. Landscape features: Natural or man-made features that channel water, such as creeks or swales, can encourage erosion in areas surrounding them. Landscaping coverage: Bare soil is particularly prone to erosion and shallow-rooted plantings are easily dislodged by water. Wet patches: Puddles can form where eroded dirt and water settle. Cracks and gullies: Like miniature river valleys, these channel flowing water and soil. Following them can reveal accumulations of soil that have eroded. Barren spots: Water can uproot plantings, leaving bare soil at greater risk for further erosion. Sunken or spongy areas: Areas that feel unstable or appear sunken are warning signs of subterranean subsidence. Structural cracks: Most buildings settle a bit over their lifetimes, but if major cracks suddenly appear, suspect hidden erosion beneath their foundations. 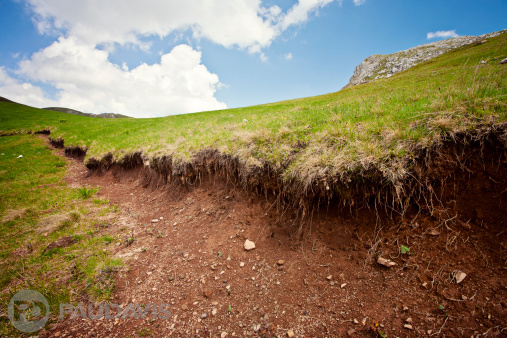 Do you suspect that erosion is threatening your property? Regrade, plant, mulch, build retaining walls – there are many options to stem the erosive tide. If best-laid preventive plans fail, Paul Davis is standing by for recovery.